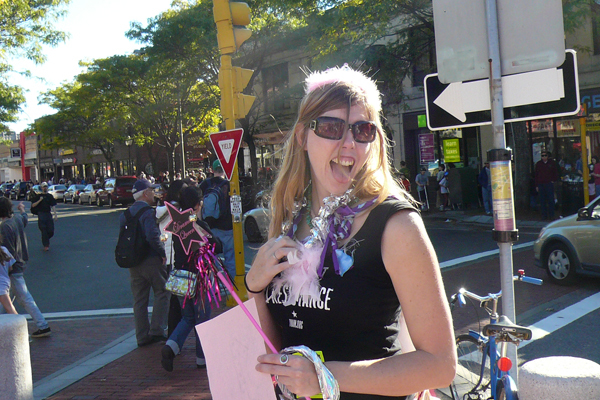 In 2009 we were invited to create a big urban game for the Honk Festival, a gathering of activist street bands and hundreds of others creating a “revolutionary street spectacle.” We took the opportunity to intervene in a powerful American icon, the princess. Tired of the princess being held captive by racist, sexist, heterosexist and capitalist forces, we wanted to create an experience that challenged all the stereotypes of what and who a princess was. Based on the early 90s board game, Pretty Pretty Princess, we created a life size variation with the same name. We also engaged some local artists in sewing us some unusual princess costumes. We’re proud to say our Pretty Pretty Princesses crossed age, race, gender, sexual orientation and who knows what else, but they were all fabulous!